Microsoft is planning to release updated Windows Defender app with Windows 10 Creators Update. Now Windows Defender Hub app for Windows 10 PCs and Mobiles is available at Windows Store. Anyone with Windows 10 Anniversary Update can install the app on PC and mobile. Help protect your device with the antimalware protection built into Windows 10. It’s already on your device! There’s nothing to buy, no subscriptions, and no nagware. Windows Defender Hub gives you access to Windows Defender, so you can easily check your protection status or scan your device. 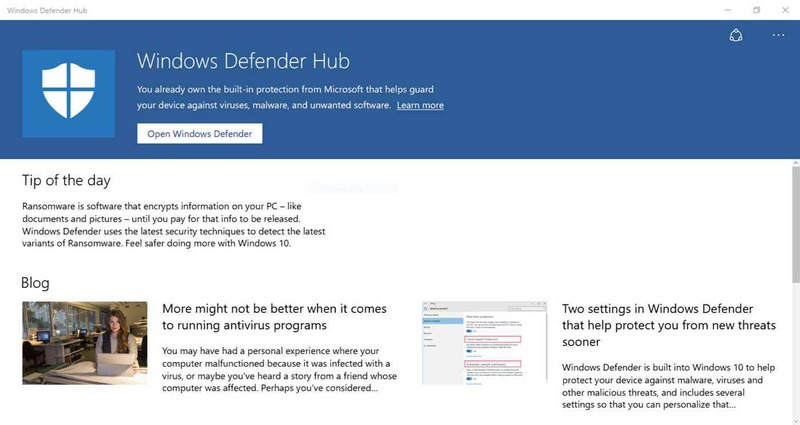 Windows Defender Hub also brings you articles from Microsoft about malware and viruses and the latest security trends, even if you use another antivirus program. You can download Windows Defender Hub app from Windows Store or from the link below.